An out and back walk up Ingleborough, one of the Yorkshire 3 Peaks, from Ingleton in the Yorkshire Dales. The walk up Ingleborough starts by leaving Ingleton via Storr's Common to head along typical Dales tracks until it reaches the picturesque Crina Bottom, the site of many a photograph. From here the real climbing starts as Ingleborough is climbed via a well maintained footpath. From the summit there are views out into Morecambe Bay and round to the Lakeland Fells as well as to the nearby Whernside and Pen-y-ghent. The path is now retraced back to Ingleton, but affords different views in the reverse direction. Parking: Limited roadside parking on the B6255 Ingleton to Hawes road (grid reference SD 701 731). Otherwise park in the tourist information car park in the centre of Ingleton and follow the Hawes road for about 600 yards around to the start. Facilities / refreshments: Toilets, cafes and pubs in Ingleton near the start of the walk. Leaving Ingleton on the B6255 road to Hawes, take the track (Fell Lane) off to the right (just short of the roadside parking) immediately after a large house where the land on the right opens up onto Storr's Common. Here, at the junction of the B6255 and the track, there is: a faded wooden bridleway sign to Ingleborough; a brown tourist information sign pointing back into Ingleton and a blue Craven District Council sign for Storr's Common. Head up the track initially walled on its right-hand side as it leads out onto Storr's Common. After a few minutes walking, the track, which briefly departed from the wall, enters between a further two walls, and is enclosed by these as the track slowly climbs affording views over to the left of Whernside and back to Ingleton behind. After about one and a quarter miles, the track passes through a gate and out onto the open fell. A few yards through the gate along the track there is a bench dedicated to Mrs Leigh's darling husband on which is engraved "Ye death cannot our hearts divide or make thee less my own twere sweeter sleeping at thy side than watching here alone". Shortly after the bench, the footpath splits away from the track which heads into Crina Bottom Farm. The very well defined, now grassy path, continues ahead keeping to the right of the farm. Behind the farm can clearly be seen limestone outcrops, a very familiar site in this area, behind and under which are vast areas of shake and pot holes. The path continues its steady climb and at its junction with a small stream a couple of entrances to pot holes can be seen. The path soon afterwards becomes rockier underfoot and starts to climb more steeply. Whernside again comes into view over on the left when the path briefly flattens before rising again this time much more steeply. The path then follows some man made steps before briefly flattening and continuing on up more man made steps. The path then leads onto the plateau on the top of Ingleborough. A line of cairns can then be followed for the final few yards to the triangulation point. The panoramic view from the top of Ingleborough is stunning. From the Lakeland hills out to Morecambe Bay, and round to Whernside, Pen-y-ghent and down to Pendle Hill. 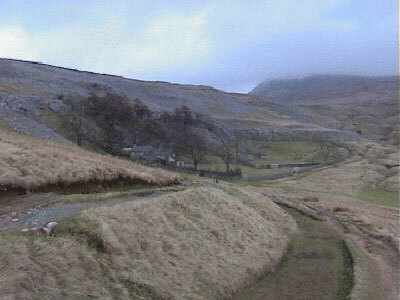 This route from Ingleton is also the one followed by the annual Ingleborough Fell Race. Follow the reverse route back down the man made steps and then down the steep slope, but this time as the path starts to flatten (grid reference 730739), a short one hundred yard diversion can be made to look at Quaking Pot. Return to the main path, and follow this back to the lane, pass through the gate and follow the lane back to Storr's Common. Cross the common and return to either the roadside parking or continue on back into Ingleton to the tourist information car park.